Last week my friend Dianna and I got the chance to take a moms only over night trip to Lake George. It was so much fun! Dianna and I have known each other for 20-years. We’ve gone away together for spring break, made it through the heartache of boys, watched each other get married and now we get to witness each other’s journey through motherhood. We get so busy with life that it was so great to get some time to reconnect! I want to share with you all the fun things we did, but I also want to share with you that going away by yourself is a wonderful thing. I didn’t want to leave my babies behind, but I wanted to get a break from the constant care and routine. Being a stay at home mom running the household and spending 24/7 with the kids IS my job. When my husband takes a vacation he gets to leave his work tasks behind for a week. I just wanted one day. A one night stay not too far from home was just what I needed to recharge. I came back feeling like a more patient and replenished mom than when I left. Plus dad’s need time to connect with the kiddos too! I get the kids to myself all the time, he deserves to have them all to himself too. Now, I feel like he understands a little better why I am so stressed most of the time. If you’ve ever wanted to make a quick get away but were afraid to leave the kids with hubby- your kids will be fine! So will hubby! After I realized how much my kids and my husband get out of this situation too, I felt more at ease taking some time for myself. I enjoyed every minute of shopping in the outlets and taking my time trying things on! No one was tugging at my shirt screaming, “mama! mama! mama!” or jumping out of a cart. I even walked through a candy store at a leisurely pace without having to drag a disappointed, tantruming child away. It was simply relaxing. After we spent time shopping at the Lake George Outlets, we grabbed a late lunch in nearby Queensbury at the Recovery Room Sports Grill. Thankfully my friend was driving so I could enjoy a mid-afternoon cocktail. The food was really good. I discovered later that kids eat for $2.99 all day every day. We will have to remember this on our next trip back to the area. After lunch we checked into our hotel room. Well, it was actually a motel room and a very run down one at that. We stayed at the Fort William Henry Hotel and Conference Center. We were situated in the motel area of the property instead of the main building. Our room appeared clean, but really run down. Call me crazy but, I expect when I pay money to stay someplace the towels they provide should not be threadbare. I had to search through the pile to find one that was acceptable. The rest of the property seemed well maintained and I may return for one more try because it is a great location, but only if we can get a room in the main hotel. Once we were all checked in and got ourselves all dolled up, we took the short walk through town to the Adirondack Winery where they treated us to a premium wine tasting. We enjoyed a “slate plate” showcasing local cheese, jellies, crackers and chocolates. We enjoyed seven samples of wine, plus a dessert wine and a full sized wine slushy. I was left wondering where this cocktail has been all my life. Thankfully they sell the slushy mix in-store, along with full sizes of the other treats we sampled. The staff was so wonderfully friendly and knowledgeable about each wine and the source of each local taste. It was a really great start to our night! The night was still young so we decided to catch some live music and hit the dance floor. There were several places with live bands and DJs. Since it was an off season weekend, most of the places were filled with locals rather than the litany of tourists. We found some place that was fun and vibrant. Even though I was surrounded by college kids half my age, it was still nice to bust a move. Yes, I still got it! I think a once a year getaway will be a really great way for us to reconnect as friends. We are moms now but we have a deeper history than just motherhood. It’s nice to laugh at all the crazy things we’ve done and catch up on where we are now. We took advantage of a Groupon deal during an off season weekend. This made it affordable for us to stay. Decide ahead of time the purpose of your stay. Are you looking for adventure? Are you looking to chill by the bar, take in a show or just spend time in the room? Making sure everyone is on the same page ensures no one leaves disappointed. Bring hotel snacks! It doesn’t have to be fancy, or it can be really fancy. I traveled with someone once who thought sushi and wine are perfectly acceptable tailgate foods. Decide between friends who is bringing what. It could be really indulgent chocolate, or cupcakes and wine. Take as many photos as you can. It is a lot of fun to look back on your time together. Don’t feel guilty leaving your husband solo for a night. He is your co-parent after all. Expect that the house WILL be giant mess when you return, or that he will NOT do things exactly as you will. But everyone is going to survive! Find out what is in the area to see and do. I found the Adirondack Winery on a Pinterest post which lead me to their website. I set up the tasting from there. Leave a list for hubby. I left behind a list of names and numbers hubby could call for questions, or back up if necessary. This eased both of our worries. Thankfully, he didn’t need the list and he had a great time with the kids! If going away over night seems like too much don’t feel bad. Until now I only ever dreamed about taking a night for myself. But scheduling time to connect, even over a cup of coffee, is a great way to strengthen your friendships and nurture who you are as a person, not just who you are as a mom. Whether you work outside of the home, work from home or stay home with the kids you deserve some guilt free time to yourself. Where would you go if you had just one night away from the house and kids? Promotional links provided in this post are for your convenience. No affiliate links are included and I do not receive financial compensation if you use them. All opinions and reviews belong solely to The Whatever Mom. Hello mamas! I have shared before how difficult it is to find foods for my super picky eaters. These girls of mine simply will NOT take even one bite if they don’t want to. So, I end up wasting a lot of food. I try not to make food a struggle at our house, but I think sometimes it just is. Other times I find myself doctoring up their most favorite food on the planet: Mac and Cheese. But, hell hath no fury like a child who does not get the right shaped pasta in her mac and cheese. It MUST be shells NOT elbows. Lesson learned. Here is how I sneak in a little extra nutrition into their favorite boxed mac and cheese. (Yes, boxed because they won’t eat my super amazing from scratch recipe). Why avocado mayo? Well, it’s adding in some extra healthy fats which little developing brains need. Why nutritional yeast? The nutritional yeast is rich with B-vitamins which my kids may not get enough of because of their limited food choices. Helps sneak in a little extra fiber and minerals too. Why veggie puree? The hidden veggies gives an extra boost of fiber and vitamins. While the pasta is draining, I put in the amount of butter specified on the package and get it melting. Once it is melted I add in the veggie puree and mayo. Once it is all mixed I add in the cheese packet and the nutritional yeast (which I have been able to convince my kids it is a “cheese booster”) and milk. Once all of that is mixed well I add the pasta back into the pot and stir. My kids will eat the entire box together. Some nights this is all they will eat despite me serving their favorite veggies and fish sticks, or chicken nuggets along side of it. Having all that extra stuff mixed inside the mac and cheese is like a little nutritional insurance policy. I don’t worry about what they aren’t eating because I know what little they are eating is still packed with good stuff. If you have a picky eater making you jump through a lot of hoops to get them to eat, hang in there! Despite my kids desire to subsist on macaroni and cheese alone, they are thriving and hovering in that 80th percentile. Got a sure fire, tried and true way to get your picky eater to eat their veggies? Please share in the comments below! Oh boy does life get overwhelming sometimes! I have a lot on my plate as a mom working from home. I have writing deadlines, I have advertiser deadlines and conference calls to make all while making sure my little sweeties are all comfy at home. This can be really hard to manage on top of everything else the household demands of me. You know- the laundry, the dishes and the broken handle on the fridge, and pretty much everything else. A few weeks ago I decided there is no reason to take all of this on myself. I know I am the one home most of the day, but there are four able bodied humans living here! We should all be pitching in to maintain our home. I’m also very lucky that my kids like to help out. It isn’t without grumbling some days because no one here is perfect. But, they do help out. The last few weeks I have delegated much of my evening/after dinner routine to the hubby and kids. I hand off a chore to each of them while I do the dishes and clean up the kitchen. The girls are five now and can easily wipe down the table and chairs, or sweep up under the table while hubby takes out the trash. Once all of that is complete we move on to toy pick up. I do not own the Strawberry Shortcake doll house, nor do I own an entire collection of Care Bears. So, why am I the only one putting them away? Now, after dinner we all work as a team to put away the toys and mess we’ve made during the day. My kids even help me get their school bags ready for the morning and lay out their own outfits for school. This is great prep for Kindergarten in the fall! (They don’t know it yet, but that’s when they’ll start packing their own lunches too). The kids have started taking care of their own laundry. They carry their own hampers to the washer, put their clothes in and start it up. (Obviously, I add in the detergent). I put it in the dryer and fold it then they put it away. I know they won’t enjoy this chore for very long, but I am taking full advantage of their enthusiasm now. When either kid complains (because every kid complains) we remind them we are a family and a team. We pitch in to help. We do not pay them for chores. But, their eagerness to pitch in does count! We take into consideration how helpful they are and how much they are growing into their responsibilities and we reward them with a trip to Build-a-Bear, or a surprise trip to their favorite ice cream store. We aren’t using any chore charts. I simply hand off a task when I need help. Also, I’m not looking for perfection in their efforts. I just want things to feel livable. If all the clutter and crumbs are put away I really do feel better, and it truly makes for fewer items on my to-do list. I’m not sharing this for any accolades or to impress anyone. Because really there are times I let the crumbs and clutter pile up because I can’t make it all work. I am sharing to let you know it’s OK to hand off items on that to-do list to your family members. We often feel like we have to do it ourselves because no one else can match our standards. Well, to that I say change your standards. Maybe you feel like your kids are too young to help, and to that I say they have to learn some time! If you are like me and find there aren’t enough hours in the day and you feel like you are always behind, give out tasks to your kids, or spouse. Start small and then add on. Even toddlers can help by wiping a table with a cloth or sponge or clear their own place at the table. As much as I miss my little babies being babies, I am actually excited about this new phase. We can now work together as a family to get things done quicker. This makes less work for each of us. On the days this all works right (again we’re not perfect) we get extra time to snuggle and sit on the couch together and talk about our day. That to me is worth it! The Whatever Mom is a twin mom learning to let go of perfection. She shares her real life struggles with parenting through her blog and contributes her time and talents as a writer to Hudson Valley ParentandMasshole Mommy. When she isn’t writing you can find her chugging coffee, folding laundry and not judging other parents. Don’t forget to subscribe via email so you never miss a blog post again! Have you heard of RuMe products yet? Maybe you see their ads all over Facebook and wonder if they are worth the purchase? Well, I have two of their products and I am in love! RuMe stands for Reuse Me. These gorgeous Eco-friendly products exemplify sustainability with a focus on self expression. RuMe offers a wide selection of colorful patterns and customization. Organize everything in your bag! This little baggie has 3 zippered pockets and replaces TWO of the bags I used to keep my items separated. I can carry my make-up, coupons, medicines and pen and paper all in one bag. This saves me from rummaging through stuff in my giant mom bag. I just pull out the Baggie All and open the one pocket I need to access! I carry the medium every day tote with me as a back up bag and reusable shopping bag. It is super easy to carry because it is light weight, it rolls up and is secured by a Velcro strap. It doesn’t take up much room at all! I use it in place of the plastic store bags and it saves me on our trips to the library, or when my kids spill something on their clothes and I need an extra bag to carry those wet things home. This adorable play mat is machine washable, has a quilted bottom and comes in two adorable prints.! It’s perfect for play dates in any location. It’s light weight and folds to fit in it’s own small tote. These are perfect for your little one to carry their own books home from the library, toys for a play date, swim gear, or gymnastics/dance outfits, or carry their own snacks. The square sides make this bag extra roomy and it holds up to 50 lbs. It is machine washable and water resistant too! You can customize the color and personalize with your child’s name. I highly recommend RuMe bags for the quality, durability and ease of use. All RuMe products are machine washable, water resistant, affordable, functional and beautiful! These are the most efficient and easy to care for reusable bags I have! RuMe offers so much more than just totes and baggies! Check out MyRuMe.com for personalized gifts like glass coasters, cutting boards, wine charms, home and office items and more! The Whatever Mom received no financial compensation for this review. RuMe products were provided for free with cost of shipping. The opinions expressed in this post belong solely to The Whatever Mom. 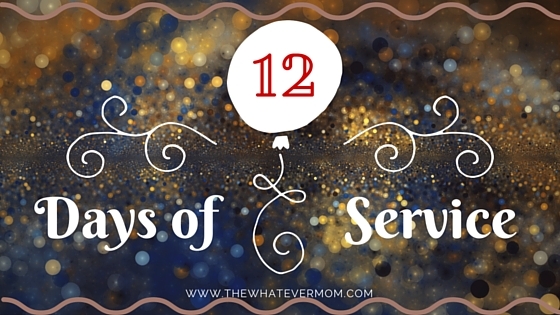 It’s the twelfth and final day of my service series! I hope you have enjoyed all the fun ways my kids and I give back during the holidays. Now there is nothing saying you have to do all twelve service projects or any projects at all. You can pick one that is the easiest and most affordable for you! Or, you can schedule it for another part of the year that is more manageable for you. Being a stay at home mom for five years now means we’ve had to survive on one income. There were a couple of tight years when my husband had to work two jobs. He delivered newspapers in the early, dark mornings on his way to his regular 9-5 job. He never had a morning off and he worked every holiday. It did not matter that there was a drop of 26 inches of snow overnight people STILL demanded their $1.00 newspaper be delivered directly to their door. I don’t know how my husband kept that job for two years. But, when providing for a family you do whatever it takes. This gave me a much deeper perspective and appreciation for people in service positions. From the person who delivers the newspaper, the mail carrier to the people who take away your garbage- we NEED them! Their jobs are valuable because they make our lives convenient and comfortable. For this I think they deserve some recognition and some gratitude. So, today we decorated our mail box! Without fail through sleet, through snow and rain our mail arrives! I would not want to walk miles in the rain to deliver a flyer, or worse bills that brings stress to many families. HOWEVER, they do get to bring me some cheer at Christmas! They fill my box each day in December with cards from family and friends. So to that I say THANK YOU!! During Christmas week we will leave a small gift outside for our mail man- a pair of gloves, a lotto ticket and a gift card for coffee. All fun things he can put in his pocket and take along with him. 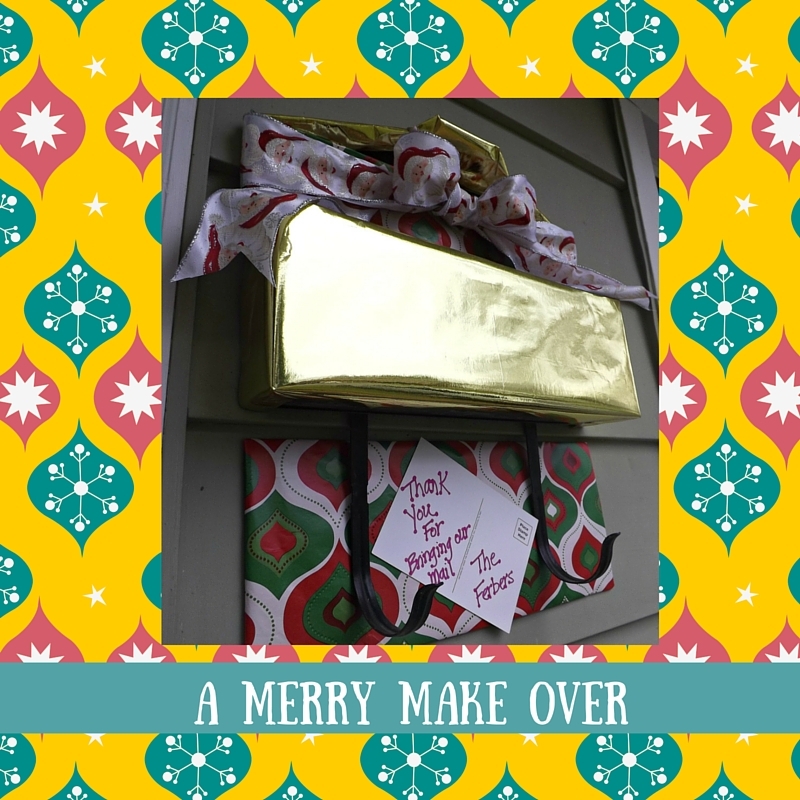 Your kids will love decorating the mail box with pretty bows and wrapping paper. Help them make a thank you card, or sign to attach to the box. Have them help you wrap each small gift and let them leave it in the mailbox for your carrier to find! This is a great way to teach kids that no job is insignificant. Thank you for sharing the last 12 days with me! I appreciate ALL OF YOU reading along and taking the time to share your comments. You have brightened my days and I enjoy sharing the Christmas spirit with you!! I’ll see you all again next week when I return to my regularly scheduled Wednesday post and Friday Favorites! I’ll never forget the Christmas my brother in-law Joe was serving in Iraq. The entire holiday season felt off because we were all so worried about his safety on the other side of the world. We built care packages for him and included items for him to share with the members of his unit. We wanted to be sure if anyone was missing letters and packages from home there was enough for Joe to share. Thankfully, he was only gone for the one Christmas and returned home safely shortly after. During his time on active duty I helped host a collection drive and assembled shoe boxes of supplies to send to our soldiers. Since then I have remembered to send letters and cards at Christmas. This year, I have found a great organization that makes it really easy for parents and kids to give back to members of the military: Operation Gratitude. 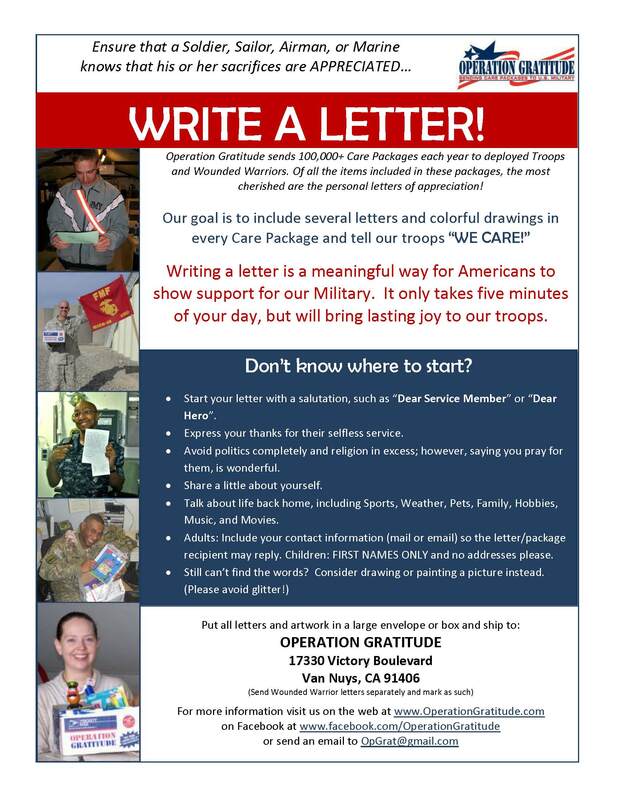 There are several ways you can share your support through Operation Gratitude. One of the easiest and least expensive ways is to assemble a care kit. This small kit of personal care items is included in care packages shipped to 150,000+ deployed Troops, Recruits, Veterans and Wounded Warriors. These kits are a valued contribution to the packages. Most requested items include: Lip Balm, Toothpaste, Toothbrush, Roll-on Deodorant, Razors, Individual packets of moist towelettes, Hand/Foot Warmers, Foot powder (travel size). You and your kids can shop for and fill one bag, or invite friends to donate items and have a stuffing party. Fill a gallon sized Zip Lock bag, or a clear toiletry travel kit with your care items. (All of which can be found at your local dollar store). Be sure to include a personal letter, or card for the recipient. If you are unable to assemble kits because of the cost, or maybe you just have really little ones and it’s hard to get everyone out of the house, write a letter! Your words of encouragement and gratitude will go a long way. Yes, even the scribbles and stickers from a small child will help brighten someone’s day! Sharing in this simple activity is a great reminder for children how important it is to lend our support and say thank you to our military. It helps instill gratitude for those who are serving to keep us safe. As we are counting down the days until we wake up on Christmas morning surrounded by our families, there are thousands of children in our foster care system just hoping for a family for Christmas. Currently there are around a half of a million children in foster homes in America; many of them waiting to be adopted by a forever family to call their own. This statistic is pretty heart breaking. But, to hear that foster kids are handed two trash bags upon entering foster care tugs pretty hard at my heart strings too. They move from home to home with their belongings in plastic bags meant to carry garbage. 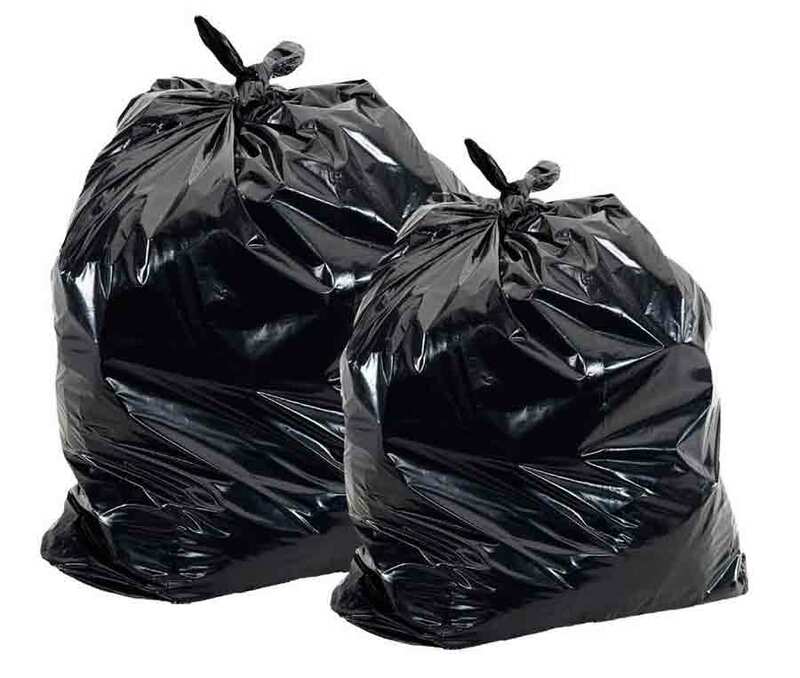 Kids in foster care get two trash bags to carry their belongings. My friend Rachel adopted her beautiful little girl from foster care. At her celebration party Rachel and her family collected comfort items to donate to our local foster kids. They decorated canvas bags and filled them with teddy bears, toys and hygiene items. They donated the bags to the local foster care division at the Department of Social Services. How can you help? Contact your local Department of Social Services to ask for a list of needed items and arrange for a drop off date. Ask your friends and family for bags and the needed items. Host a get together to decorate the bags and fill them. Kids of any age can help stuff items into a bag and help bring comfort to these vulnerable kids. The GIVEBACK BOX can assist 10 children in your local community with Care Packages this holiday season. Not sure you have the time to get out and gather up the items yourself? Together We Rise makes it even easier! Make one online donation of $50 to sponsor a sweet case and you’re done! Sweet cases are duffle bags filled with comfort items and hygiene items and it gives children in foster care a more dignified way to move to a new home. You can sponsor one case, or call upon your friends and family to split the cost of a Give Back Box! For a $250 donation ($25 per person times 10 contributors) you can purchase a kit filled with all the items you need to stuff 10 sweet cases. Host a get together in your home, or round up co-workers at the office to decorate and stuff the bags. Then, deliver to your local foster care agency. Shipping is FREE on the first 20 bags. LAST SHIPPING DATE IS DECEMBER 14TH via FEDEX. Whichever way you choose to give back it will have a great impact on a child going through a difficult transition. This is a great way to help instill compassion in your young children, and it gives them greater perspective that some kids just need a family.